THE BOOK: FUORI! 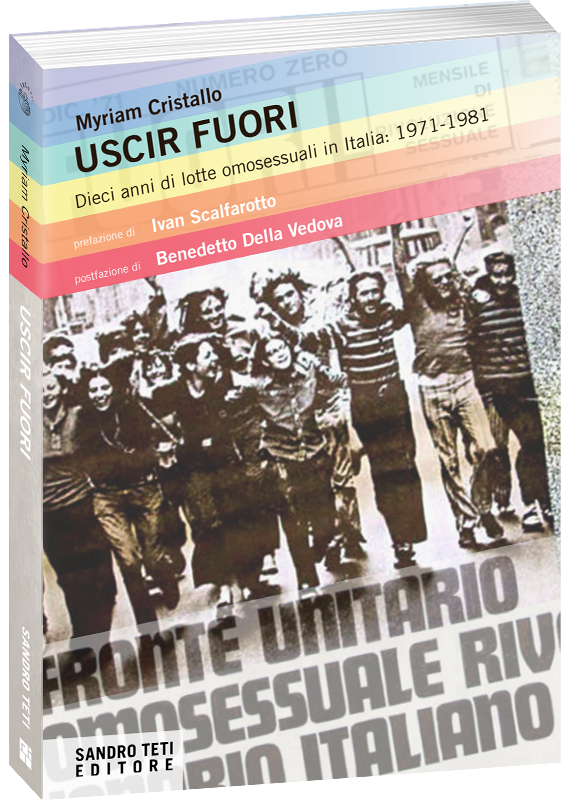 was the first Italian Omosexual Association born in 1971 thanks to the commitment of someItalian activists. It is is the historial memory of the movement and the promotor of a literature award which brings the same denomination. The author brings in the book her personal life experiences, inside the FUORI! Association also, getting back to those years in which the first and pioneeristic struggles against the “respectable” system to obtain civil rights in the Seventies when being omosexual was considered a social tabu and a topic dealt with ignorance and prejudice. Myriam Cristallo shares her experience of FUORI! talking about the relationships with the left wing parties and Partito Radicale, as well as about Pierpaolo Pasolini and Umberto Eco speeches covering a period that goes from the first unprejudiced struggles, the fight against the Church up to the homophobe assassinations. This is an essay that pushes the reader to read, re-read and think. Myriam Cristallo, was born in Turin. She taught Italian literature and History at secondary schools. In 1970 she was the only heterosexual founder member of FUORI!. In 1972 she cooperated with the Milan magazine Utopia which dealt with marxist philosophy and whose editor in chief was Mario Spinella. Afterwards, she wrote and published non-fiction essays. Ivan Scalfarotto (Pescara, 1965) is a politician, writer and activist. Graduated in Law in Naples, he worked in Banca Commerciale, Banco Ambrosiano Veneto and Citigroup. He is in politics since 2009. He’s a civil rights activist, and in 2015 and 2016 his name was listed in the Global Diversity List among the influential 50 people that promote “diversity” culture and equal opportunites. Benedetto della Vedova (Sondrio, 1962). Italian politician. Ha graduated at Bocconi Univerity in Milan in Economic matters and cooperated with Radio radicale and the most important Italian financial newspaper, Il Sole 24 Ore. He was member of the Italian and of the European Parliament. «Siamo quello che siamo, viviamo in un Paese migliore, perché qualcuno ha parlato quando era più comodo tacere, si è esposto quando era più comodo nascondersi, ha preso posizione quando era più facile mettersi da parte». «Questo libro è bello per la freschezza. Comunica un’immediatezza, a livello anche espressivo, che conquista il lettore. È un libro che mi è piaciuto molto». «Quando ho letto questo libro mi è sembrato di fare un tuffo nel presente. Tante tematiche, persone, racconti che Myriam ha fatto in questo libro sono tuttora attuali. Una ricostruzione fondamentale per i giovani, affinché conoscano la storia, di cui spesso ci dimentichiamo».